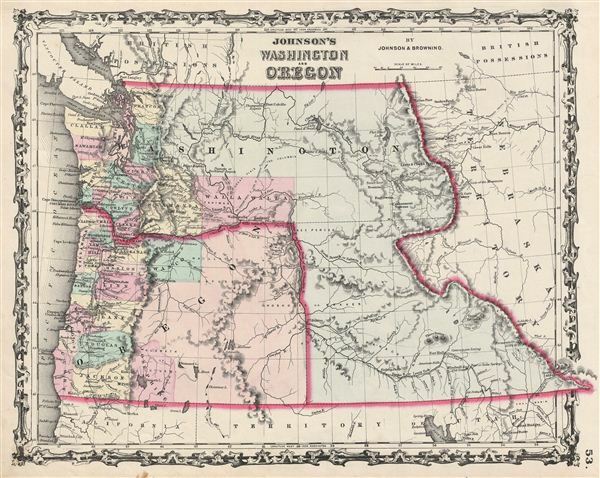 A beautiful example of A. J. Johnson's 1861 map of Washington and Oregon. This rare map offers a fascinating snapshot of this region shortly following the outbreak of the American Civil War. Shows the state of Oregon with much of its eastern regions unsurveyed. Washington is a massive territory extending eastward as far as the Rocky Mountains where it abuts Nebraska Territory. Most of the western regions of Washington Territory, what today includes parts of Idaho and Montana, are unexplored and dominated by various American Indian nations including the Snakes, the Pa-nacks, the Nez Perce, and others. Notes Fremont's 1843 route as well as the suggested route for the Pacific Railroad as proposed by Governor Stevens. Also notes geographical features including the Tetons, Mt. Rainer, Mt. Adams, Fremont's Peak and the Three Buttes. Features the strapwork style border common to Johnson's atlas work from 1860 to 1863. Published by A. J. Johnson and Browning as plate number 53 in the 1861 edition of Johnson's New Illustrated Family Atlas. This is the last edition of the Johnson Atlas to bear the 'Johnson and Browning' imprint. Subsequent editions reflect Ward's 1862 acquisition Ross C. Browning's shares in the firm.